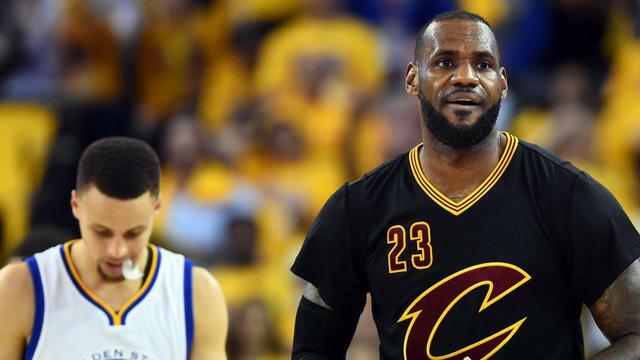 Home » Unlabelled » Cavs End Title Drought? OAKLAND, Calif. – Magnificent. It’s the only word that can describe this spectacular three-game stretch from LeBron James, one that began last Monday in a season-saving win at Oracle Arena, continued with a blowout of Golden State on Thursday and then, this: 27 points, 11 rebounds and 11 assists in a 93-89 victory in Game 7 of the NBA Finals on Sunday that clinched the Cavaliers’ first championship in franchise history. The Cavaliers became the first team to overcome a 3-1 deficit in the Finals and ended Cleveland’s 52-year major professional sports championship drought. “For us to be able to end this, end this drought, our fans deserve it,” James said. “They deserve it. And it was for them." In a series marred by lopsided scores, this was tight early. Both teams played to their strengths: Cleveland was physical, bullying Golden State on the boards (48-39) and in the paint (48-28). James – fresh off back-to-back 41-point games – was assertive, racking up 12 points, eight rebounds and five assists in the first half. While all eyes were on Stephen Curry, it was Draymond Green who provided a first-half spark, piling up 22 points – and making all five of his 3-point attempts. Green was the only Warriors player who looked comfortable. Curry scored nine points in the first half, but needed eight shots to get them. Klay Thompson was worse. Curry’s sidekick scored five points on 2-of-9 shooting in the first two quarters. Fortunately for Golden State, James received less help. After scoring 64 points the last two games, Irving could muster just nine in the first half. And Kevin Love, desperately in need of a breakout performance, had five points on 1-of-5 shooting. The battle between James and Curry, already chippy, continued in Game 7. James blocked a Curry layup in the second quarter, lingering in Curry’s vicinity for a few seconds. Curry turned, bumped into James' chest and began barking at the Cavs star. Green interceded, and referee Mike Callahan needed to step in and separate them. Golden State, which won a record 73 regular-season games, took a seven-point lead into the locker room – a lead Cleveland erased in three minutes. From there, it was a series of runs: a five-point lead for the Warriors; a seven-point lead for the Cavaliers. Irving came alive in the third quarter, pumping in 12 points. Harrison Barnes shook off a rough first half to chip in seven. Golden State took a one-point lead into the fourth quarter. If the absence of Andrew Bogut wasn’t felt in Game 6, it was in Game 7. Bogut, the Warriors’ starting center, was lost for the season to a knee injury suffered during Game 5, and the Cavaliers took advantage, pounding Golden State on the boards and in the paint in Game 6. Kerr countered with Festus Ezeli in Game 7, but Ezeli (zero points) was ineffective, and Anderson Varejao’s suspect hands effectively forced Golden State to play four-on-five. Midway through the third, Kerr abandoned both, playing small the rest of the way. The back and forth continued in the fourth. Curry knocked down a three over Tristan Thompson; James responded with a pair of turnarounds. Klay Thompson hit a contested shot over J.R. Smith. James hit back with three free throws. With less than two minutes to go, Andre Iguodalasoared for a transition layup that would have given Golden State a two-point lead. James blocked it, an out-of-nowhere rejection that has become part of his repertoire. Irving drained a three on the other end, and James extended the lead to four with a free throw. A Curry miss – his 13th of the night – sealed it, and the Cavaliers’ bench rushed toward James, Akron’s prodigal son, who delivered the championship he promised when he returned to Cleveland two years ago.